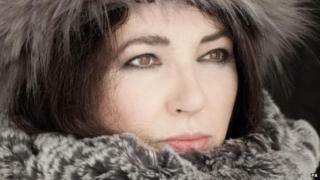 Tickets for Kate Bush's first live shows in 35 years have sold out in less than 15 minutes. Tickets for the 22 dates at London's Hammersmith Apollo went on sale at 09:30 GMT on Friday morning. The star said she was "completely overwhelmed by the response". "Thank you so much to everyone," she added. The Before the Dawn concerts, which take place this August and September, mark the singer's first return to the stage since The Tour Of Life in 1979. Demand was so high that the singer's own website, as well as some ticket-selling sites, crashed as people tried to log on. The BBC's Colin Paterson reported that tickets with a face value of £135 were already being offered on sale on secondary ticketing sites for more than £1000. The six-week tour, which travelled around Britain and mainland Europe, ended at the Hammersmith Odeon - now the Hammersmith Apollo. Following the initial announcement of 15 dates last week, seven more dates were added in response to "massive pre-sale demand". "Kate decided to add the extra shows in a bid to make sure as many people who wish to see a show can do so," said the official statement. A spokesman for Ticketmaster UK described the demand for tickets as "phenomenal". "At our peak, the Ticketmaster website had over 65,000 fans looking for tickets," said Simon Presswell. "Despite playing 22 dates, demand has significantly exceeded the number of tickets available so regrettably a number of fans will be left disappointed." Bush, whose hits include Running Up That Hill and Babooshka, last released an album in 2011 - the Brit-nominated 50 Words For Snow. Why did Kate Bush never tour after 1979?